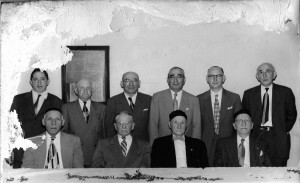 Shul Board and Officers, circa ? Occasionally, while rummaging through files at the shul, I come across an item of general interest— in this case a water-damaged photo of what appears to be the Board of Directors and Officers of the shul. I believe that the officers are sitting in the front and board members in the back. But since all of these men are before my time, I don’t know their names. This information is important for our archives, so I am asking for your help. I also would like your opinion on the possible year (plus or minus) that this may have been taken. If you know the names of these folks, please respond below where it indicates to Leave a Comment. Please don’t send your comments by email. I have a clue that may be helpful. In very faded handwriting at the bottom of the original photo are the names of the men. They are barely visible. But I scanned it, and manipulated the contrast and density the best I could in order to make them even somewhat readable. Some of the names appear to be Herbert Isaacs, Miller, Ziontz, Moskovitz, George Raskin, and Edward Klee. You can CLICK on either of these to get the enlarged versions, which also may be helpful. Al Brunwasser sent me an interesting story to share with the congregation. 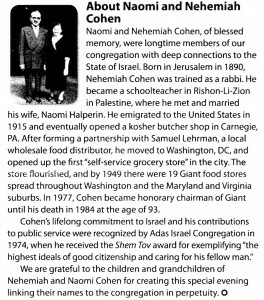 It appeared in the bulletin of Adas Israel congregation in Washington DC. 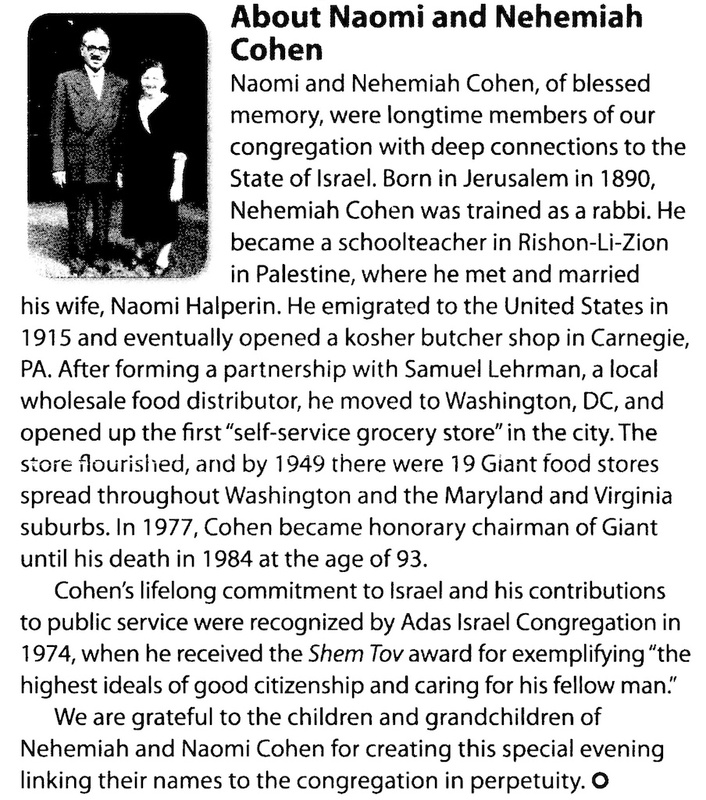 The story is about Naomi and Nehemiah Cohen. Please see the article at the right. Who knew that the guy who started Giant groceries was from Carnegie? Coincidently, Al tells me that his great uncle Joe Cohen had a fruit market just up the street in Glendale way back in the day. When this conversation started, I thought it would a simple one. But it has yielded some very interesting comments and I realized I should have posted it here on the blog so that everyone could see and comment. This dialogue started with a request from Lynn Donovan asking who were the rabbis when she was a member here between 1958 to 1965. Since my source of historical data, Stan Roth, is no longer with us I sent out an email asking for information. Let me post the responses here and you all can continue the conversation directly. “Do you know why Rabbi Weiss left and where he went? 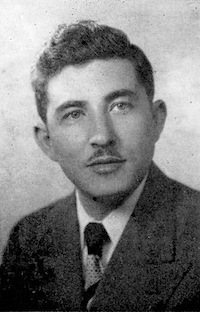 The photo of Rabbi Weiss is from the Shul’s 1953 Jubilee book. At some point I will scan in the entire book and post a link. In the meantime, please feel free to add your answers/questions/comments below.